Petal Talk: Peonies: Going Fast in the Heat!! Peonies: Going Fast in the Heat!! The girls enjoying the breezy screen porch. Not that I should have found it surprising, but it's hotter here in northwest Indiana than it was in South Carolina! ﻿﻿﻿﻿﻿﻿﻿﻿﻿﻿﻿﻿﻿﻿On our way to Edisto Island, I was concerned that it would be too hot to enjoy. It barely reached 80 degrees during the day and it was humid, but there was a constant and delicious breeze. In fact, our Cairn terrier, Abby so enjoyed the weather that we had to lure her inside with cookies. at left and 'White Cap' at right. You may remember my lament about leaving my garden in mid-May when the peonies were just beginning to open. 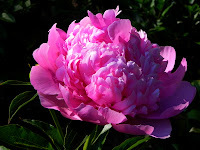 We came home yesterday evening, just in the nick of time to see nearly all 40-some peonies opened up. I cut a bouquet just before dark so I could enjoy the flowers indoors. The Chinese peony 'Rare Flower of Frosty Dew' bloomed for the first time and it's fragrant! 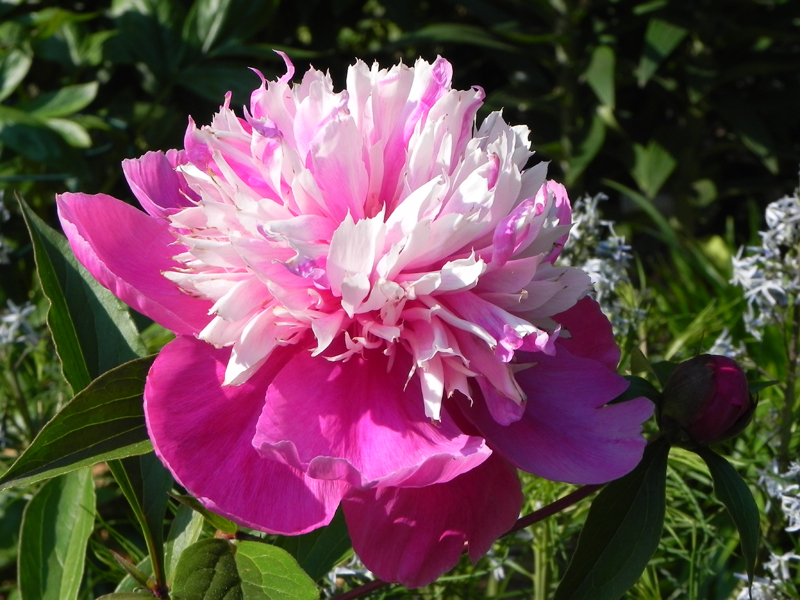 It took this variety three years to bloom, but I'm happy to say its perfume adds a great deal to the heady mix that pervades my garden when the peonies are at their peak. Another first-time bloomer is Don Hollingsworth's 'Judith Eileen', a fragrant bomb form with great substance and texture. 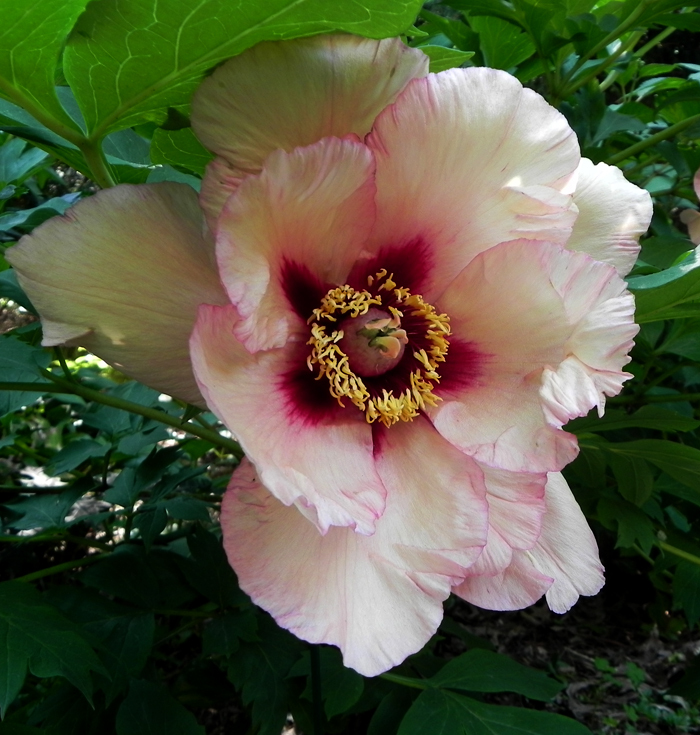 My last tree peony to bloom is 'Ariadne', an absolute stunner introduced by Nassos Daphnis. All of his tree peonies have such wonderful, ethereal coloration. I now have two of his introductions, including 'Calypso'. 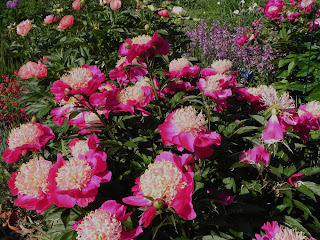 Wow, your Peonies are stunning! How wonderful that you got home in time to see such beautiful sights. I must say I really love 'Ariadne'! That is something special. Can you please tell me where you purchased "Rare Flower of Frosty Dew"? Thank you! I purchased this from Cricket Hill. It is also available from Peony's Envy.